Floral Paper Parasol from Thailand, "Peacock and Flowers"
The vibrant plumes of a peacock sway across the crest of this saa paper parasol from northern Thailand. By Nikom, the piece is embellished with bamboo spines and hand-painted with intricate designs in oil paints. Opened: 66 cm H x 82 cm Diam. Opened: 26" H x 32.5" Diam. Closed: 66 cm H x 8 cm Diam. Closed: 26" H x 3.2" Diam. 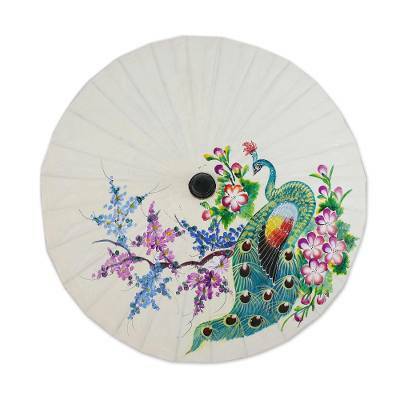 You can find saa paper parasol 'Peacock and Flowers' by Nikom in decor accessories categories such as East meets West Home Accents, Floral Home Accents, Paper Home Accents and Bamboo Home Accents. Enjoy exploring these sections for other Novica treasures. The hand painted peacock is exquisite. It is truly a work of art! The Saa paper is sturdy and the umbrella is surprisingly hefty. This parasol will be perfect for our Florida visit in the hot sun. Thank you Nikom for a wonderful product. I got the peacock parasol and a dragon one. The artwork is delightful! I'm moving soon and am looking forward to decorating my new place with colorful items from around the world. I wish Nikom and his family much success! I bought another for myself and one for my granddaughter. The craftsmanship is wonderful and every item arrives safely packed and wrapped. These parasols are absolutely delightful. I loved every aspect of opening the package and reading the message from Nikom himself. It was a special experience. I have always loved Parasols and plan to support Nikom in sharing his gifts with the world! I just received my Saa paper photo frame, 'Sweet Memory'. It came nicely wrapped and was constructed beautifully. Made a great gift! Thank You!